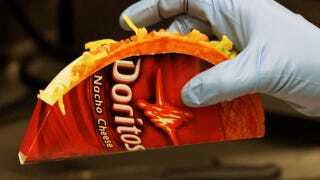 Look, you can argue this fact all you want, but a fact it remains: Taco Bell's soon selling tacos made out of giant Doritos, and you're going to eat one. No, shh—it's true. Millions of orange shells await. The Doritos Locos Tacos, already available at a few experimental Taco Bell locations—the Los Alamos of shockingly cheap Mexican food—will roll out worldwide. And then, it'll be too late to resist, you stupid gourmand. You think you're too good for Taco Bell, maybe? Hah, no, friend. That's not how it works... But if you're going to be difficult about it and turn up your nose, try this on for size (like an enormous taco): the company has already mass produced 85 million Doritos taco shells ready. Update: Pick up an oxygen mask before you read this: FoodBeast reports a Cooler Ranch, also known as "the best" flavor will be available shortly after the initial springtime rollout.